Kitakata, in Fukushima Prefecture, is known throughout Japan as a mecca for a particular type of ramen. I had a chance to eat my way around the city before learning all about the history of the city's architecture while staying at a friend’s amazing house over Golden Week. But it isn’t simply ancient masculine pride that accounts for their prevalence. In the 13th year of the Meiji Period (1868-1912), there was a large fire that started in the heart of the city and spread outward. While the fields and other structures were reduced to ash, the sturdily constructed kura by and large remained unscathed, thanks to their large walls and fire-resistant craftsmanship. Combine their resilience with the fact that they’re naturally warmer in the winter and cooler in the summer (which helped maintain consistent temperatures for sake storage), and it’s easy to see why they’re still used as residences to this day. 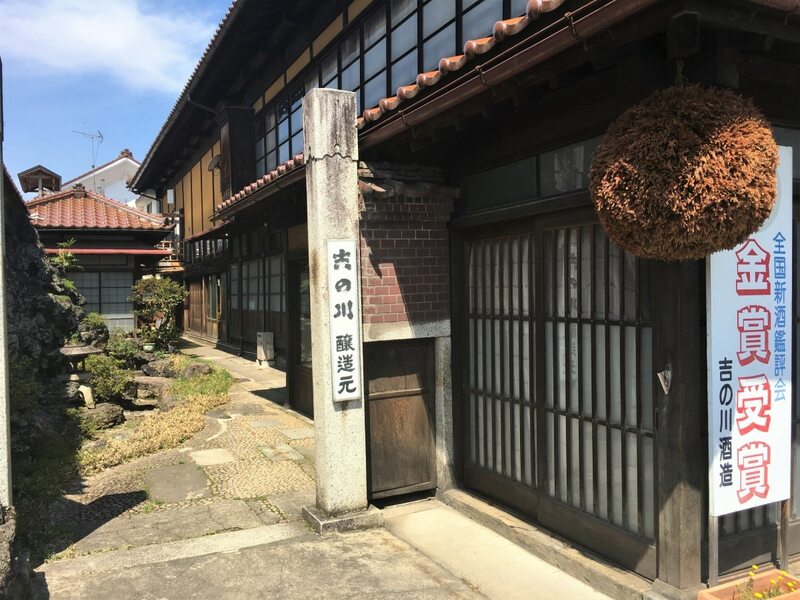 While it’s hard to choose a stand out from an area brimming with jaw-dropping buildings, the crown jewel of my exploration of the city was the historic Kai residence. A multi-storied beauty built in the Taisho Period (1912-1926) by an insanely wealthy man who had the means to construct a kura so large that other houses in the area were demolished just to bring in the materials, the Kai residence is operated as a museum and is free to enter, although the small tour they offered was only available in Japanese. Even so, it's worth stopping by to get a closer look. Trust me when I say that you could wander Kitakata’s winding streets without running into the same gorgeous building twice. One thing I did not expect was the opportunity to stay in a kura residence myself! The friend I was staying with—my former Japanese teacher when I lived in the area—let me stay at her family home. In typical Japanese fashion, the humbleness with which she had described her place did not do it justice. I haven't included pictures to respect her privacy, but even though she described the room my traveling companions and I would occupy as small, it was enormous, positively oozing with personality and history, and I'm incredibly grateful for her hospitality. Some establishments were lined with dozens of people since it was Golden Week when I visited, but there are so many to choose from that even someone as impatient as I am (when it comes to ramen, at least) couldn’t complain. I ordered a bowl with extra pork (breakfast is the most important meal of the day, after all), and somehow managed to finish the entire bowl. But that wasn’t all that was on the menu. At a place appropriately called the Kitakata Ramen Jinja (shrine), there are photos on the wall of the different signature dishes of the many ramen restaurants throughout the city. Like so many other buildings around town, this one was beautifully maintained. There’s also a giant bowl that's just perfect for a photo-op, which I was all too happy to indulge in with my friend visiting from Chicago. But the real surprise was that they even had ramen ice cream! It isn’t as weird as it sounds. While the illusion is spot on—it looks like ramen noodles topped with a fish cake piled on an ice cream cone—the ice cream had a lightly-sweet miso flavor and the fish cake was actually made out of the Japanese rice cake, mochi. Topped with just a tiny bit of spring onion and pepper, and it was an unusual but surprisingly refreshing experience. It’s always strange going back to a place you used to live. While my time living in the Aizu area was admittedly short (a little under a year, most of which was spent covered in the large amount of snow that falls there) and it was my first time in the country, I was really surprised by how strong of an identity Kitakata has. Whether it was something they'd cultivated in the time since I’d lived there or was buried under the surface all along—just waiting for a fresh-faced college grad to discover it—is hard to say. 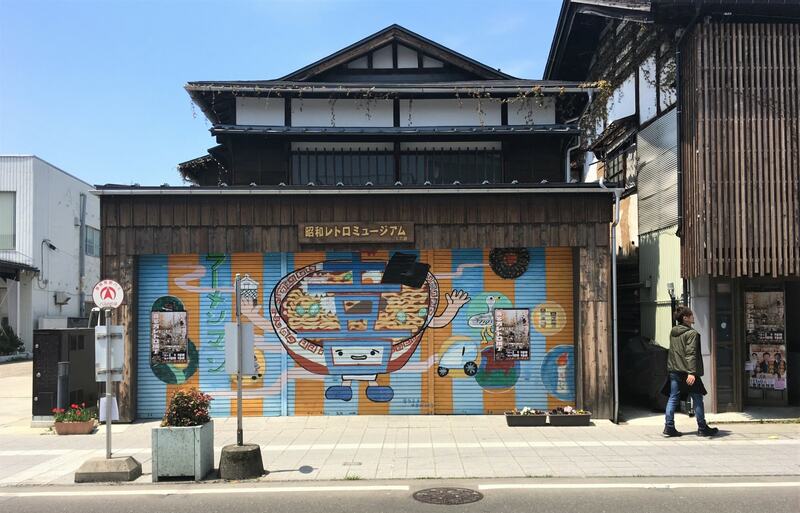 But considering the delicious ramen and sake, the awesome architecture, the quality of its traditional goods, and the strange touches around town that make it just the right amount of weird, Kitakata has a lot to offer! I’m itching to go back the first chance I get.